A retired prison guard enters a mangy garden apartment. He is there to exact revenge on a thug who raped his granddaughter and beat the rap. He ties the thug to a chair and prepares to cut off the man’s thumbs. But the thug frees himself and pins the old man facedown. Near death, the old man puts a gun into his mouth and pulls the trigger, knowing the bullet will carry through his skull and probably kill the thug on top of him. This tale, “Johnny Cash is Dead,” is one of a dozen grim and gripping stories in Jordan Harper’s new collection, Love and Other Wounds. As this title suggests, Harper tells violent and pessimistic stories about desperate people, but his stories are redeemed by intelligence and a strange kind of hardscrabble elegance. Roughly half of the stories in Love and Other Wounds are set in Missouri, and the Ozark region in particular. Harper’s heroes are plainspoken, decent men pushed by circumstances to pursue desperate acts. Convicts, neo-Nazis, drug-dealers, badass bikers and devious women are common foils. In a few stories, Harper deviates from this norm: One of his stories concerns a feud between Jamaican and native-born drug-gangs in Brooklyn, New York. Another story concerns an overweight jewelry store clerk who is played for a patsy by a criminal planning a jewelry heist—at least until she plays him. Still another concerns a broken hearted cop whose vengeful plot devolves into a killing spree. 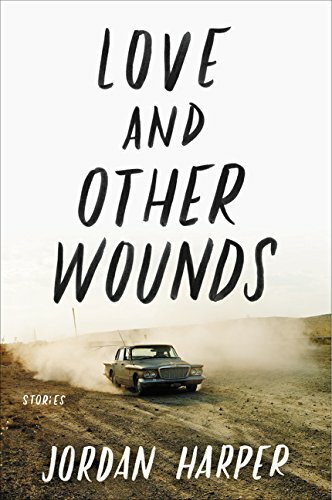 Love and Other Wounds joins a short list of recent, stark short story collections that light up the dark underbelly of contemporary rural America: Alan Heathcock’s Volt and Josie Sigler’s The Galexie and Other Rides are two of the best examples of this sub-sub-genre. However, Harper is less character-driven than the former and less literary than the latter. In total, Harper’s stories may be better compared with the early movies of Quentin Tarantino than his literary brethren. Like Tarantino, Harper shares an infatuation with graphic violence and plots built around decent people in ugly lines of work. And like Tarantino, Harper relies on staccato plotlines and intelligent writing to mitigate his moments of violent excess. Love and Other Wounds is not for everyone. But it is fabulous niche reading for those seeking dark and darkly intelligent fare.